George Rudé was born in 1910. After the war Rudé joined E. P. Thompson, Christopher Hill, Eric Hobsbawn, Raphael Samuel, George Rudé, John Saville, Dorothy Thompson, Edmund Dell, Victor Kiernan and Maurice Dobb in forming the Communist Party Historians' Group. In 1952 members of the Communist Party Historians' Group founded the journal, Past and Present. Over the next few years the journal pioneered the study of working-class history. As a member of the Communist Party Rudé was blacklisted and was unable to obtain employment in the university system. He was for many years a teacher of modern languages in secondary schools in England. Later he obtained university posts in Australia and Canada. Books by Rudé include The Crowd in the French Revolution (1959), Wilkes and Liberty (1962), The Crowd in History (1964), Revolutionary Europe: 1783-1815 (1969). In 1969 Rudé co-wrote Captain Swing with Eric Hobsbawn. 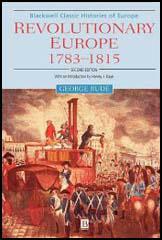 Other books by Rudé include Paris and London in the 18th Century (1970), Hannoverian London: 1714-1808 (1971), Robespierre (1975), Ideology and Popular Protest (1980), Europe in the 18th Century (1985), The Face of the Crowd(1988) and The French Revolution (1989). George Rudé died in 1993.